At first glance running might seem like a rather selfish endeavor. Hours spent alone on the roads and trails, producing health perks that benefit no-one but the runner. Add to that expensive running gear that takes a big chunk out of already tight family budgets, and it really does seem rather self-serving, doesn’t it? But, if you delve a little deeper, you’ll soon discover a bigger picture. A very positive one at that. You’ll find mothers who run in order to take care of themselves so that they can be better moms and wives to their families. You’ll find dads who run to relieve stress and stay healthy so that they can be there for their kids in the long run. And you’ll find good, ordinary people who run to stay positive and happy in challenging, trying times. You’ll also find runners like Chris Cooper (below, right), who takes it one step further. 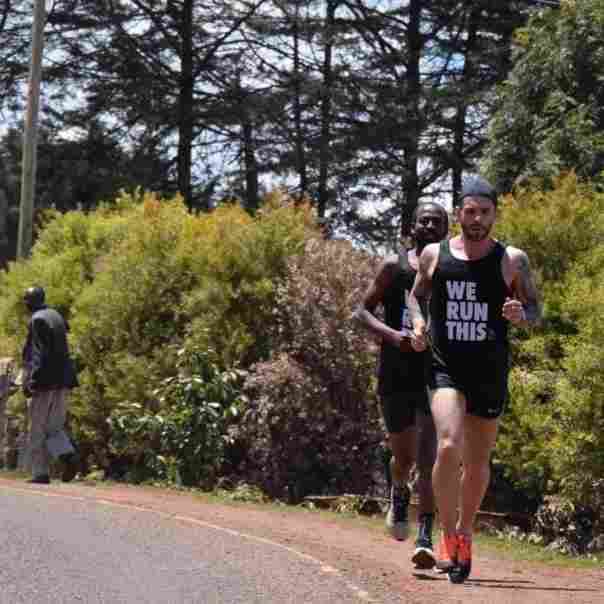 Chris, based in Germany, runs to make a difference in the lives of hundreds of underprivileged children in rural Kenya. 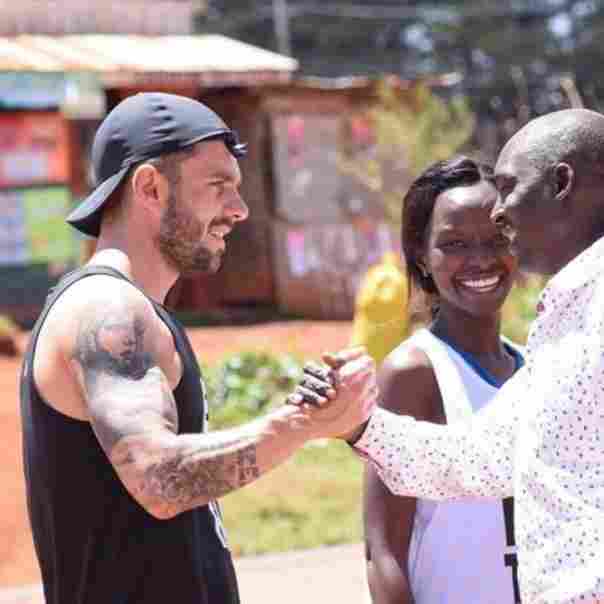 He has turned his passion for running into something that touches the lives of people far beyond the borders of his own family, community and even country. Through Runners Heal, an initiative that saw the light in 2017, Chris runs to bring hope and a better future to a new generation of young Kenyans. Picture courtesy of Runners Heal. Chris started running at the age of 29 after a bout of double pneumonia caused him to reevaluate and change his lifestyle. Inspired by Mo Farrah, who himself admires the athleticism of the Kenyans, Chris set off on a running research mission that ultimately led him to a book by Adharanand Finn, called Running with the Kenyans. In this book, Finn recounts his experiences of living in Iten, Kenya, or the “home of running”. 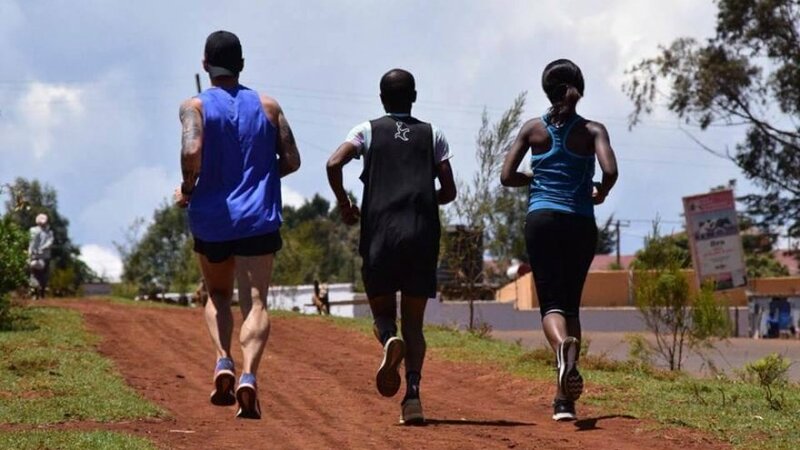 Inspired by these experiences, Chris contacted and signed up with Hugo van den Broek, Dutch marathon record holder and online running coach based in Iten. After a year of online training with Van den Broek, Chris set off on his very first journey to Kenya in April 2017. The initial purpose of his visit was to meet his coach and experience the Kenyan running lifestyle for himself. But it quickly grew into so much more. 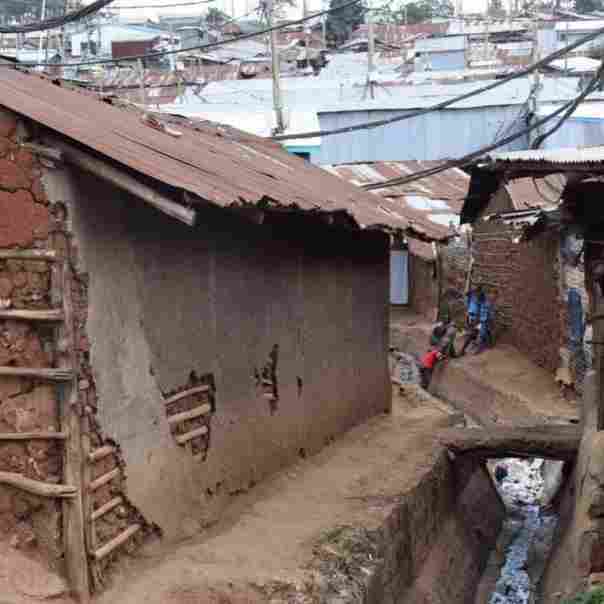 Faced with the reality of the poor living conditions, extreme hunger and lack of hope that he found in young Kenyan children, he felt an overwhelming need to take action. Enter Runners Heal, the vehicle through which Chris and his team makes an effort to relieve poverty and bring hope to the children of Kenya. The Runners Heal team currently consists of founder Chris, qualified nurse Catherine Paul Chepkong’a and Hugo van den Broek, Chris’ coach. 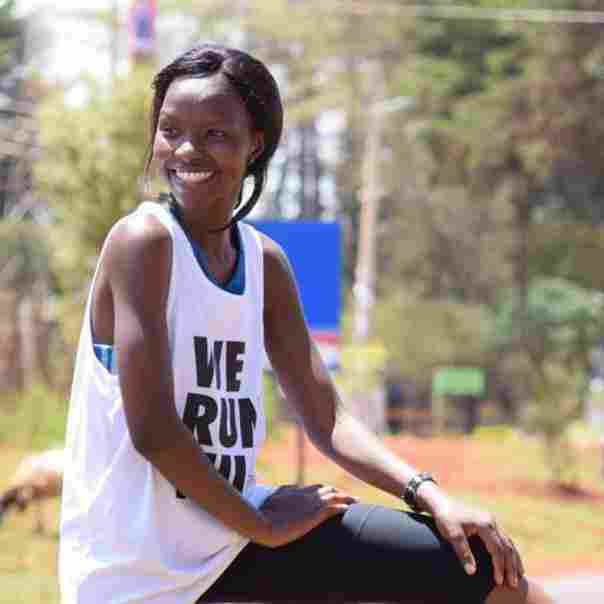 Chepkong’a (below), who is also a running enthusiast, is based in Eldoret, Kenya and provides medical care and assistance on behalf of the team on a full-time basis. So how exactly does Runners Heal make a difference? Well, the team’s strategy is basically based in the following three principles: Relieve, rebuild and re-educate. Firstly, school by school, they relieve the immediate hunger crisis by providing a guaranteed school meal for all pupils. For many of the pupils this is the only meal that they will receive in a day. Then the team moves on to rebuilding the school’s foundation by providing agricultural solutions. These solutions involve re-educating both the school staff and the pupils to grow their own food, take care of animals that provide food and successfully operate this model over the long term. Proper nutrition is anticipated to have a direct influence on both school attendance and education results. Which, in turn, ties in with Runners Heal’s core focus, namely providing the children of Kenya with hope and a fair start. Runners Heal’s first and current project focuses on the Songeto High School. The first phase of the project, focusing on immediate hunger relief, has been successfully concluded with a total of three months’ worth of food provided for 360 children. The team is currently focusing on the rebuilding of Songeto Primary School, constructing a boarding dorm for children with a daily 2-hour commute to school on foot, plus sinking and equipping a borehole for food production on the school grounds. A team from Runners Heal will visit Songeto again in September 2017, when they will focus on the construction of the above-mentioned features, as well as re-educating the staff and pupils to produce their own food and care for their food-producing animals. Purchase a bag or running shirt from the Runners Heal website. For each shirt purchased, three months’ worth of food can be provided to one hungry child. Spread the word on social media. Make others aware of the need, as well as of Runners Heal and the action they’re taking. Donations and sponsorships. These help with the establishment of farms at schools, which enable children to grow and provide their own food. Run for Runners Heal. Run one of the world’s big city marathons while raising funds for Runners Heal. Get your hands dirty. Contact Chris directly if you’re keen to travel to Kenya with the team to make a difference on the ground. So, go on. Dare to let your running be about more than just yourself and your own family. Join fellow runners Chris, Catherine and Hugo to make a difference in rural Kenya. Or find a purpose that’s closer to home if that’s where your passion lies. Running gives you the perfect vehicle to do good and make a difference – both to yourself and to others. So why not make the most of it?